While I find it important to take actions that make sense for me and my immediate environment, I don’t kid myself about the overall effect of reducing my footprint to 50%, 10% or 1% of its original value or my planetary individual allowance. It will not “save the planet” or help overthrow the systems that put life at risk. For good perspective I recommend “As the World Burns: 50 Simple things you can do to stay in denial” by Stephanie McMillan and Derrick Jensen. 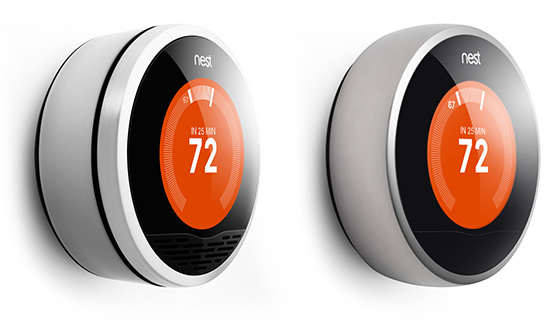 Today Nest announced it’s newest version of their programmable thermostat. I had the incredible luck of buying a Nest “1.0” on the day it was released (10/25/11), *by accident*. My previous thermostat had died the day before and after adding it to our e-recycle box (thermostats have mercury and other materials that need to be correctly handled i.e. not chucked on the top of a landfill where it will slowly seep into the surroundings) I googled for thermostats and the Nest showed up – I read about the features and after some frustrated attempts at their website (“Why does the checkout page keep crashing! ?”) I placed an order. Only later did I realize it had been unveiled just hours earlier and all the web was a-twitter about the new product of Tony Fadell, a former Apple designer I admire for taking on a job to more directly work on things that are good for our ecosystem. Nest Thermostats are a form of smart control that are make it easy and automatic to keep your house comfortable using less. Nest improves efficiency by taking into account furnace types and heat inertia to better time when gas has to get burned; and reduces waste by allowing you to control it remotely and sense when everyone is away. The little data I have suggests the Nest has reduced the heating natural gas used in my household by about 20% – once I correct for water heating, the only other use of natural gas use at our place, and a series of efficiency upgrades we did shortly after. Analyzing it from a perspective of “Dollar to % savings”, it has been about 10x as efficient as changing our insulation (a $6000 job that improved our heating efficiency drastically) or the prospect of upgrading our furnace (depending on installation costs, it could be $5000 to replace a 80% efficient furnace with a %97 efficient furnace, without considering a heat pump system for simplicity of the comparison). Replacing insulation in attic & crawlspace: $6000 for ~ potential $20%. The previous thermostat was not optimally programmed to week by week changes, it was a hassle to program anyways, did not modify its own programming based on your real day-to-day behaviors, did not sense when we were out of the house, and did not allow us to control it anywhere via our phones (think of the convenience to turn the heat on from your car as you approach home at the end of a day outside), did not provide nice monthly reports to give you a sense of what’s going on, etc. etc. I am also glad I got rid of the Honeywell device due to their corporate practices selling weapons worldwide and their ridiculous suing of Nest for patent infringement in -get this- “round thermostat” design and asking you setup questions. Nest is trying to get the USPTO to see the ridiculousness of those patents. I don’t want this post so sound like an ad, but the Nest did save a lot of burnt natural gas for everyone, and saved money for us. Plus, it looks stunningly gorgeous on our wall, and I especially like how the screen fades on and off as I walk by. For my house, this LED bulb became the star as the house has a lot of small recessed lights in high-traffic areas. All in all we have replaced 34 50W halogen bulbs (that’s 1700 W spread between the kitchen, stairs, hallway and main bedroom) with 29 of 7W Philips LEDs (to 203 W). Just swapping the kitchen lights and hallway/stairs lights made a measurable difference. In this area of the world, days are short in the wintertime and you need lights on until 9AM and from around 4:30 PM. The halogen bulbs required 8 TIMES more electricity. Temperature: 2700K – a nice, warm color suitable or ambient lighting. I also used the opportunity to remove some bulbs that were making lighting too uniform. Now light follows social function of the space better in the family room. For my “good” goal of 16 kWh/day, having a kitchen circuit with 10 x 50W for 3 hours was blowing 1500 kWh – that’s just one room in the house eating up 10% of the energy budget! What’s the Return of Investment? 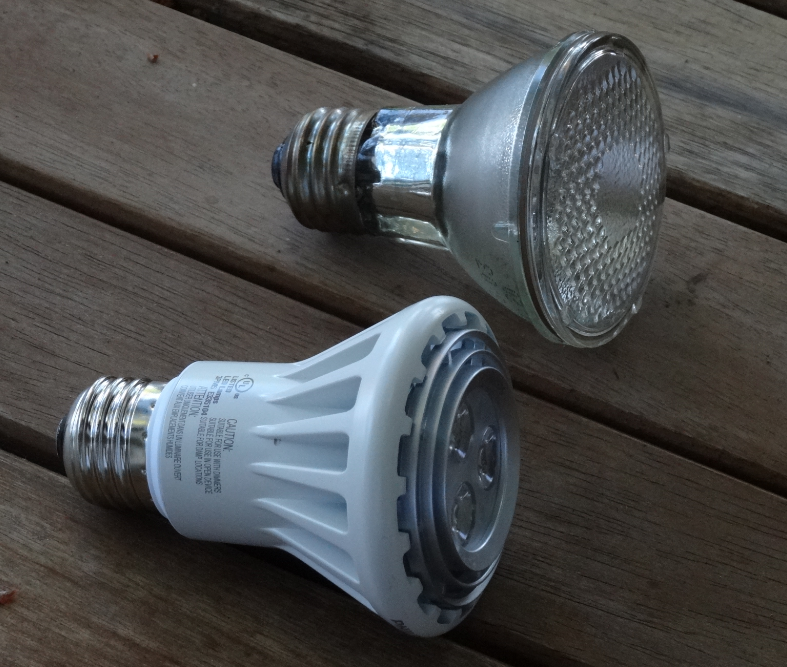 LED bulbs are not cheap and it’s not where you start with an energy reduction effort, but I saw an immediate difference in the electricity use in the bills. Since these are recessed lights, having kill-a-watt meters is not possible (how long until in-wall switches and outlets report their use via wifi?) so there is a little bit of interpolation going on. I spent a lot of my ‘efficiency’ budget on these bulbs (once I had improved house thermal insulation, and done other basic improvements). It will take around 10 to 15 years for a recovery on the investment assuming the bulbs live their advertised life and assuming some 3hs of daily use. It would take 23 mega Watt-hours to keep the halogen bulbs on, and they would need many many replacements along the way. With these LEDs it’s buy once and 3200 kWh using the same assumptions. Even though my energy sources are now somewhat renewable, they still have a carbon footprint larger than zero, so using less Watts is still good beyond the money. Why reduce your footprint at all? Why reduce our footprint? What is the need or the drive? Does it matter? What does it change? Who cares? I have found that in trying to answer these questions I bounce between three perspectives. Ecosystem-of-life: A study on how communities of humans can coexist with nature in sustainable systems. 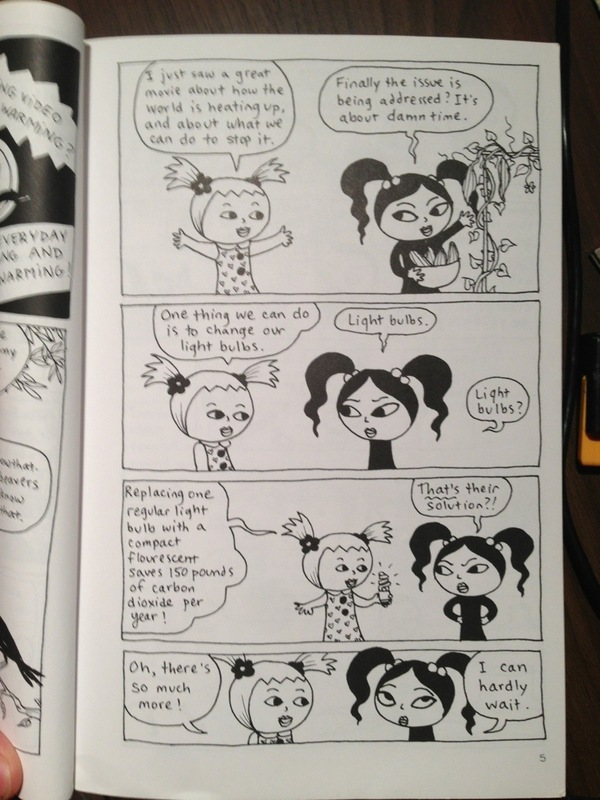 Spiritual-community: A spiritual perspective on doing what’s right for the sake of yourself and others. Whimsically, these three frames are typically represented using wheels, so yay. The earth is a closed system (as far as we know: except for the sunlight, radiation, and chunks of space stuff coming in; and radiation, heat and gases and spaceships going out). For life as we know it to exist in this planet (and specifically, human life) there are certain physical characteristics that need to be maintained. Scientists are making progress in determining what are the metrics within which we can live on the planet, defining what is called a ‘habitable envelope’. If environmental measurements go outside the envelope, species survival is at risk. Here you can download the actual paper “Planetary Boundaries: Exploring the Safe Operating Space for Humanity“. Bad news is that we’ve blown three boundaries, and still can’t get a grasp on how to measure two others. Good news is that we are starting to think about, measure and track these boundaries. The worse situation we can be in is one in which we don’t even know what they are – which accurately describes the state of affairs for most of humanity’s history. If you make lifestyle changes that help rope these 10 boundaries in, you are helping save all life. Permaculture is an area of research that takes a dynamic-systems perspective at sustainable living. 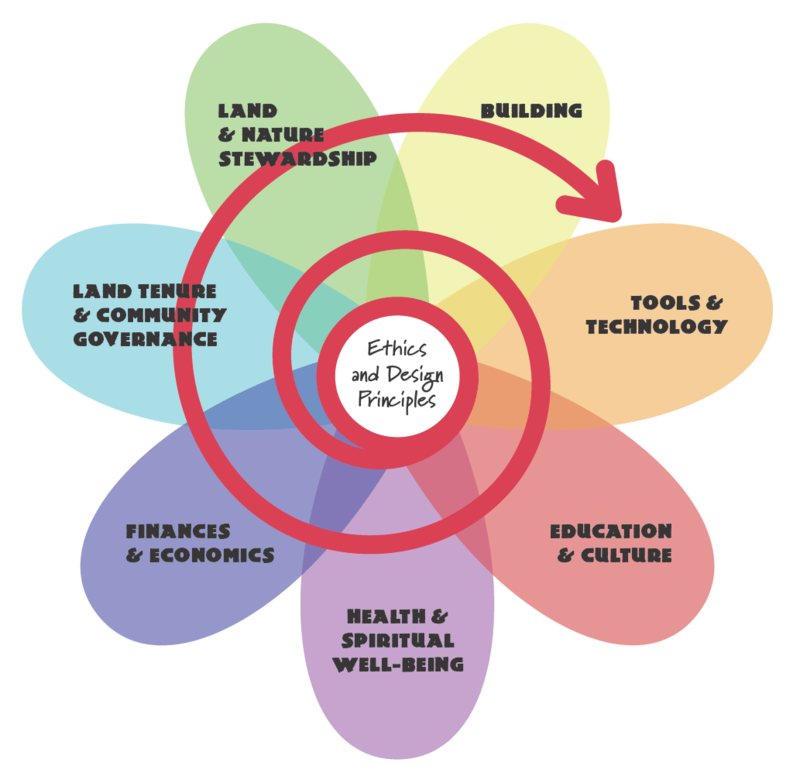 The system encompasses ethics and design principles, Health & Spiritual Well-being, Finances & Economics, Resource Governance & Stewardship, Building, Technology, Education and Culture. Care of the Earth: Provision for all life systems to continue and multiply. Care of People: Provision for people to access those resources necessary for their existence. Setting Limits to Population and Consumption: By governing our own needs, we can set resources aside to further the above principles. While suburban high-income environments are FAR away from a permaculture ideal, every time you help make incremental progress towards the principles outlined in the discipline you are helping in your bit. For example, you may not be involved in agricultural land stewardship, but you can decide to stop using artificial pesticides on your lawn, or replace a patch of your grassy garden with some cool vegetables and local plants. The spiral around the flower underscores the incremental nature of effort. We should not discount that there are ways of life and decisions we take that make us feel better because they are right. Buddhism has developed the eightfold path “to develop insight into the true nature of phenomena (or reality) and to eradicate greed, hatred, and delusion” It is typically represented as a wheel, too. When we do things that are good for our mind, body, community, other living beings, and the planet, we feel a sense of well-being that is strong yet humble and ego-less. Wisdom (Sanskrit: prajñā, Pāli: paññā) 1. Right view Try to look at life, nature, and the world as they really are. 2. Right intention Aspire to rid yourself of whatever qualities you know to be wrong and immoral. Ethical conduct (Sanskrit: śīla, Pāli: sīla) 3. Right speech Make best use of your words. 5. Right livelihood Do not to engage in trades or occupations which, either directly or indirectly, result in harm for other living beings. Concentration (Sanskrit and Pāli: samādhi) 6. Right effort Make an effort to abandon all the wrong and harmful thoughts, words, and deeds. 7. Right mindfulness Keep your mind alert to phenomena that affect the body and mind. 8. Right concentration Meditate to supress desire, anger, sloth, restleness, and doubt. Try these wheels out when explaining to yourself or others why you want to reduce your footprint. In different occasions, you may find it resonates more to rely on the shock of the cold realities of the physics that make life possible life, on the appeal of living integrated to our ecosystem, or the wellbeing from doing what is good for yourself and others. The extra cost is used to purchase Renewable Energy Credits (RECs), which represent 1 MWH of actual energy production. RECs place a monetary value on the environmental attributes associated with renewable energy generation, thus making it easier for the developer to get the necessary funding to build their project. So in that sense, RECs do make it easier to get the startup capital needed, which does help to encourage the creation of more small & renewable generation stations. If I put up a wind generator, and I generate 1 megawatt for 1 hour, I have two things I can sell – a megawatt-hour (MWh) of electricity, and a REC, which is worth some cash (I estimate around $10 per REC). PSE sells electricity to people. They want more of it. So PSE buys my megawatt. Some people want “green power” so they also “buy” RECs from PSE which are worth a bit of cash. PSE has to buy a REC from my mini-utility to meet these people’s demand, or fail audits. By using the RECs (and the associated auditing that comes with this ‘virtual good”), the consumers can say “I want renewable electricity” – and have to put their money where their mouth is – and PSE has to get them from somewhere. Some folks claim this distorts the market. That is true. But the market is already VERY distorted as it is: with externalized costs (which every non-renewable generator has tons of), large R&D and supply-chain subsidies (which large nuclear, hydro, etc. projects have), and a central controlling distribution entity consumers can’t choose (which almost every utility company is). With RECs I have a way to express my demand, so for me it removes some net distortion. I also see claims that purchasing RECs are a way to offset your carbon footprint. RECs are not carbon-reduction tokens. They are a token of demand of renewable electricity, and I believe you can’t buy RECs beyond the amount of Megawatt-hour you consume. In addition, some renewable energy sources are still carbon positive (that is, they still throw some previously captured carbon into the atmosphere, even if at lesser rates and from smarter sources than, say, coal). Therefore buying RECs won’t offset the emissions of your car. I know this sounds like an ad – it is not- but there are few things that you can do that are as smart, cheap and easy to reduce your energy footprint as signing up for the PSE Green Power energy. and choose 100 percent. If you don’t do it, I would love to understand why, and how you feel about it. Changing your source of electricity is one of the simplest and cheapest things you can do to reduce your footprint. Many utilities are offering “Green Power” options where a part of the electricity you use is purchased from more sustainable sources, for less than the price of a monthly LED bulb. 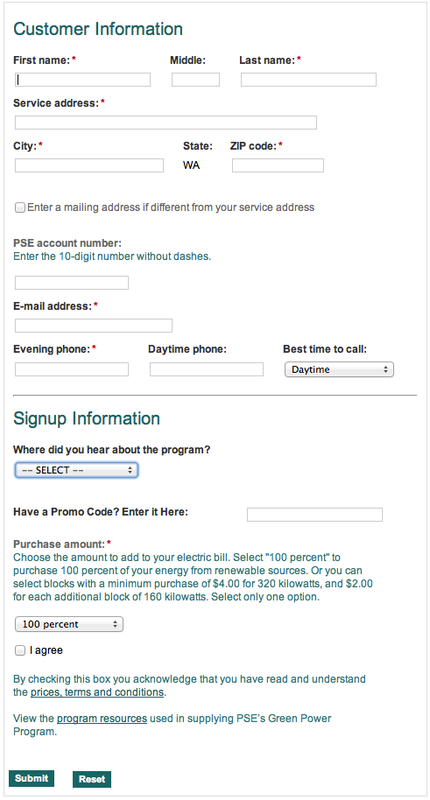 We live in the Pacific Northwest, and our power company here (Puget Sound Energy) offers a Green Power program where you pay a bit extra, in order to get a % of your electricity purchased from farm, biogas, and small hydro. Why does it cost extra? The extra cost is used as startup capital to encourage the creation of more small & renewable generation stations. In other words, your money will go into creating new independent businesses that will provide more renewable generation capacity in the region. How do you know it is “your” electricity that is being generated? There is no way to differentiate an electron from another. Technically, you are not buying their electrons, you are instructing your utility to buy more generation from them, proportional to your use, and place it in the grid. Update. This was such a frequently asked question I made this other post: More Details on PSE Green Power. Large Hydro: 36%. Large hydro creates flood areas, change water tables, and disrupt natural flow of organisms along rivers. Coal: 32%. Burning coal pumps CO2 and other pollutants into the atmosphere. Earth requires less CO2 in the air to sustain humanity. Natural Gas: 30% Natural gas, another fossil fuel, pumps large amounts of carbon into the atmosphere. Nuclear & Other: 2% While nuclear is potentially a good “bridge” technology for a carbon crisis on earth, or super-specialized uses like biomedical and space exploration, it requires adult handling and our civilization is too immature yet to meet the long-term safety standards required by this technology. Wind Power: 50%. There are many generating farms in the region, especially towards the East where it’s windier. Landfill gas: 24%. I’m not a fan of this as it increases the profit margin of landfills, but if it’s there, you may as well use it. Low impact Hydro: 10%. Small hydro generation doesn’t require the big government subsidies, decades-long maintenance contracts, and large flood valley areas of large hydro. Biomass & Wood Waste: 7%. Burning wood waste instead of creating an acidifying pollutant by dumping chips. It’s popping back some CO2 into the atmosphere, but it’s from carbon that was captured in our geologic era. Livestock & Methane: 7%. Cows & their manure are a major source of greenhouse gases (GHGs). Capturing the methane for burning and producing power is smarter than farting it into the wind. I’m not a fan of supporting livestock industries, so increasing their profit margin is something I wouldn’t choose to do. Solar Power: 2%. The pacific northwest has high latitudes and a large part of it has a constant cloud cover, getting less than 150 Watts per square meter. The eastern region has higher solar exposure, however. Ideally, PSE would allow me to select where my extra money will go. I don’t want it going to a landfill generator… but I most certainly prefer that to a coal or gas generator. Is this the best I can do? No, probably the best you can do is live on a farm or plant enough crops on your house or roof to then create alcohol that you feed into simple thermal generators or burn in lamps made of clay from your own garden. This would be a resilient, carbon-neutral, zero-supply-chain solution (except for the generator, if you buy it). It won’t run your microwave oven, however. Do what you can. 1) Go to PSE.COM, log in or create your account. There is NO LOGICAL REASON NOT TO DO THIS! Reducing footprints is hard, especially because a lot of the information, criteria and end results are hard to know, or unknowable. You can measure things that are at-hand – such as your own electricity consumption-, via sensors, meters, or even subjective gut-feel scoring, but you cannot really measure or quantify values such as the carbon footprint of your utility company, and you cannot verify yourself the business practices of Phillips’ suppliers in China other than by some google searches. In any case, you want to take a fact-based approach to reducing your footprint. Asking what should change, why and how. Finding out information first hand, through the Internet, or from experts. Try stuff out in deliberate ways. See if what you tried changed anything. Hopefully by separating these thinking areas the whole effort of reducing the footprint becomes more approachable.